Looking down on the McCloud River from the precipice of Middle McCloud Falls. Running water seems to have a magical allure for people. It is not uncommon for many people’s favorite hikes to follow creeks or rivers through the mountains. This should not come as a surprise. There are few things in the world as attractive and refreshing as clear, running water. When water such as this is found in beautiful alpine places, it is a nature lover’s siren call. 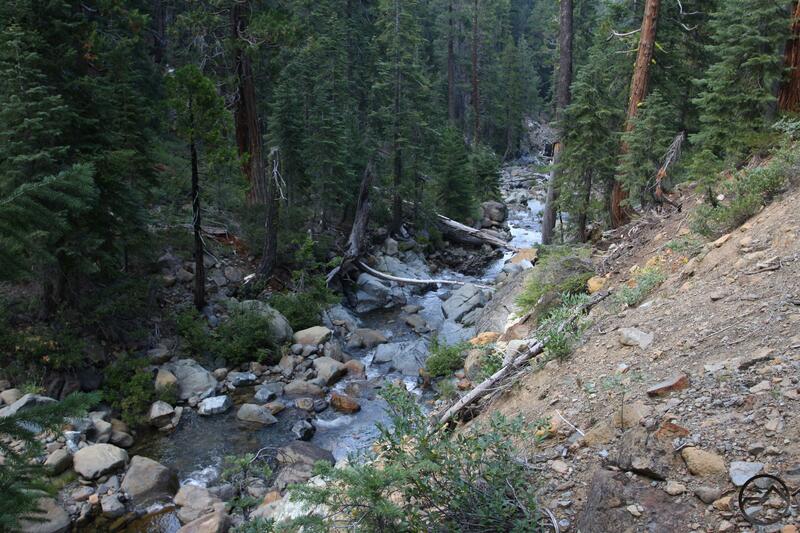 In many mountain regions it is typical for trails to run parallel to creeks and rivers. The paths these waterways have carved through the mountains often make the most obvious course for trails as well. The water, following the path of least resistance, has made it easier to penetrate into the heart of the mountains. This rule holds true for most of the alpine trails in Northern California. Whether in the Sierra Nevada, the Klamath Mountains or in the Cascades, this rule generally holds true. 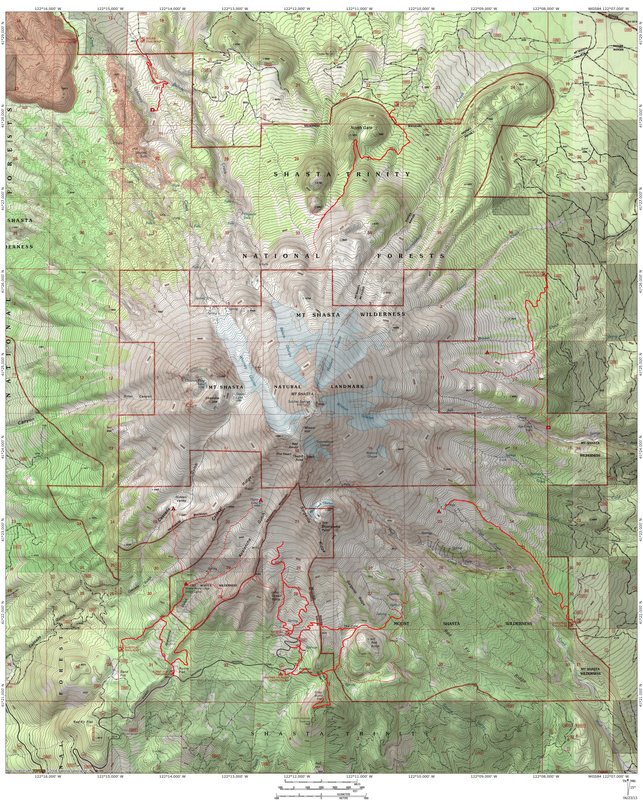 Surprisingly, the Mount Shasta area is a significant deviation from this rule. Although there are many rivers and creeks in the region, few of them can be enjoyed from trails. Rather than following the canyons carved by running water, it seems the trails in the Mount Shasta area tend to run along open ridges or simply cut through the heart of the deep forests that blanket the region. This is not to say that the trails are utterly dry and lack access to water. Instead, the trails tend to run somewhat perpendicular to creeks and rivers and, while crossing them, rarely make sustained contact. Thankfully, there are some fantastic trails that break this pattern and allow hikers to enjoy a prolonged encounter with the clean, clear alpine water. The best of these trails are naturally going to focus on the Sacramento and McCloud Rivers. While this may suggest heavily used trails, especially along the McCloud, it is actually amazing how little use the bulk of these trails get and how deep the subsequent solitude can be. In all cases, the scenery is always excellent and the hiking extremely enjoyable. 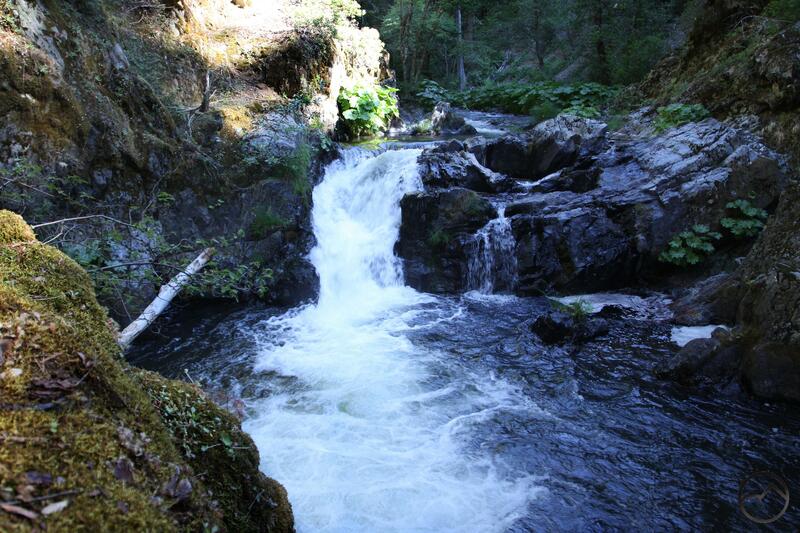 Following one of the McCloud River’s largest tributaries, the Squaw Valley Creek Trail actually offers the chance to hike along two distinctly different creeks. Squaw Valley Creek begins high on Mount Shasta and makes a precipitous journey south through the town of McCloud and Squaw Valley. By the time the trail begins, the creek is large and raucous and flowing through a narrow, heavily wooded canyon. The path stays near to the water and is highlighted first by some confining, rocky gorges and later by a pair of small but very scenic waterfalls. By combining a short section of the Pacific Crest Trail, hikers can also descend down a dirt road that parallels Bear Trap Creek and then return to the trailhead via the Squaw Valley Creek Trail. This is a great loop. Bear Trap Creek begins small, first as a series of seeps on a steep hillside and eventually growing into a moderately large creek by the time it arrives at its confluence with Squaw Valley Creek. The return trip along the main creek is a classic Creekside trail. The Sacramento River from the Sacramento River Trail. While most Northern Californians are familiar with the Sacramento River, most probably have images of the large, lazy river meandering through the northern half of California’s great Central Valley. From Redding on south, this is a fairly accurate picture of the longest river in the Golden State. However, north of Redding, or more precisely north of the stilled waters of Shasta Lake, the Sacramento River has an entirely different appearance. Here it is a roiling mountain river, racing from cataract to riffle, through rocky gorge and deep canyon. Unfortunately, the preponderance of this section of the river is inaccessible to hikers. One significant exception to this is the Sacramento River Trail in Castle Crags State Park. Accessed by an awesome swinging bridge over the river, the trail maintains a parallel course along the Sacramento for over a mile. Initially slung on a steep wooded slope dozens of feet above the water, the path eventually drops down next to the river. This latter section offers great access to the Sacramento. Never out of sight or sound of the water, the trail is a fantastic and seldom used exposure to a wonderful river. Mount Shasta rises high above Bolam Creek. 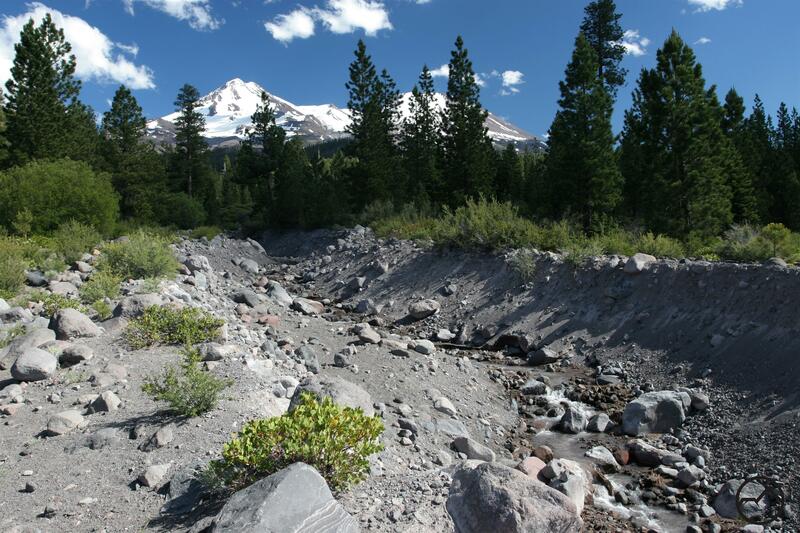 Mount Shasta is not known for being the source of large creeks. The southern and eastern sides of the mountain produce a handful of sizable creeks and a couple of them are large enough to sustain their flow all the way to the McCloud River. The north side of Mount Shasta also produces some glacier-fed creeks though these can often be fickle and their flow uncertain. The largest of these are Whitney and Bolam Creeks, each sourced from eponymously named glaciers. Not running constantly, their flow is strongest on hot days when the glaciers melt rapidly and the runoff surges through the north side’s deep canyons. The Whitney Falls trail parallels Bolam Creek for about a mile before making a traverse across a low rise and arriving at a vista point high above Whitney Creek. The section of trail along Bolam Creek is one of the more unique creek side hikes in the Mount Shasta area. The volcanic geology of the area is immediately evident. Rather than a normal earth and rock bound channel that is typical of most creeks and rivers, Bolam Creek races through a narrow u-shaped gully composed of loose volcanic ash and partially exposed boulders. It gives the impression that it would not take a tremendous amount of water to completely alter the course and character of the creek. Though the area surrounding Bolam Creek is wooded, it is not nearly as dense as the forests the rest of the trails on the list find passage through. Consequently the Whitney Falls Trail tends to have more views. Needless to say, if hikers are fortunate enough to time their hike on this trail when water is flowing, they will be in for a treat that is highlighted by the tremendous view of Whitney Falls crashing into its deep canyon, a spectacle further highlighted by Mount Shasta’s snowy crown. The North Fork descends into the unknown. 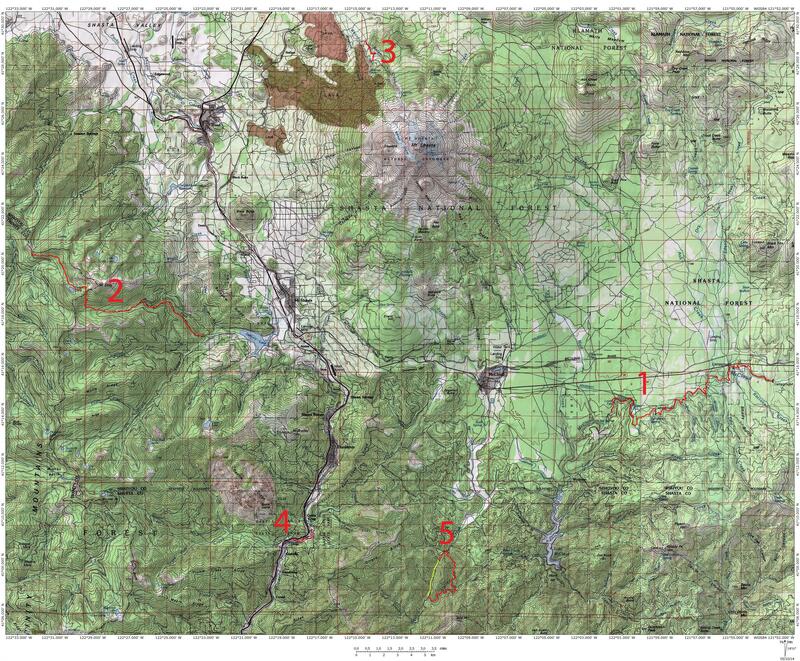 Cloaked in mystery and rarely hiked, the Sisson-Callahan Trail is one of the longer hikes in the Mount Shasta area. Due to its length and its remote nature, this trail is best done as a shuttle hike that begins on the Pacific Crest Trail. Those few who make this journey are presented with the opportunity to witness the birth of the North Fork of the Sacramento River in a series of springs bursting from the high reaches of a deep canyon. From there the trail runs parallel to small streams descending down to a large meadow complex from which the North Fork emerges as a large and boisterous creek. The meadow is a vast and beautiful area. Craggy red cliffs rise high overhead and the dense stands of lodgepole pine endow the area with a high elevation alpine feel. From the meadow, both trail and North Fork makes a 6 mile descent down to the main stem of the Sacramento. Along the way the river pours over a seemingly endless series of cataracts and through numerous rocky gorges. This section of trail is extremely remote and the sense of isolation here is as real as it is pervasive. While the Sisson-Callahan Trail is not completely unknown, its length and challenge of reaching its further reaches limit the number of people who hike the trail. Those fortunate enough to explore this trail through remote country will have an intimate journey with a fantastic river. 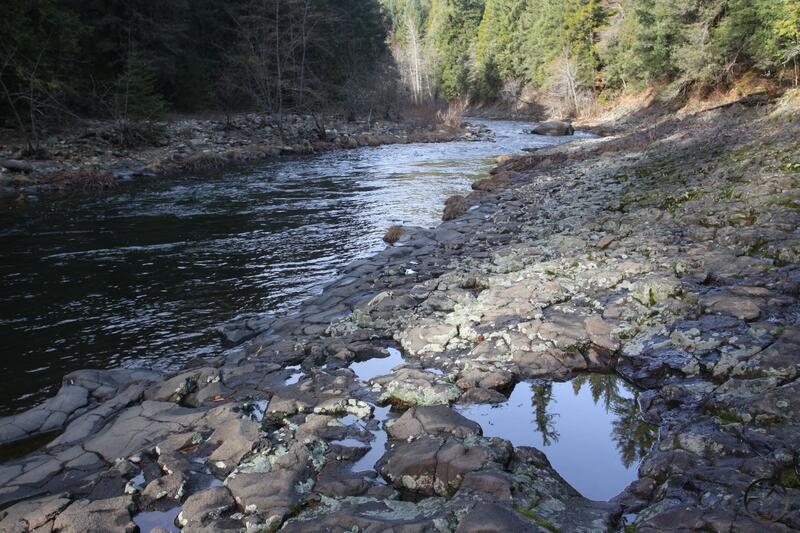 The McCloud River runs through a basalt gorge. It should not come as a surprise that the McCloud River Trail gets top billing on a list of the best creek and riverside trails in the Mount Shasta area. The trail is justifiably well-known for its trio of excellent waterfalls, which is one of the finest collections of waterfalls in Northern California. 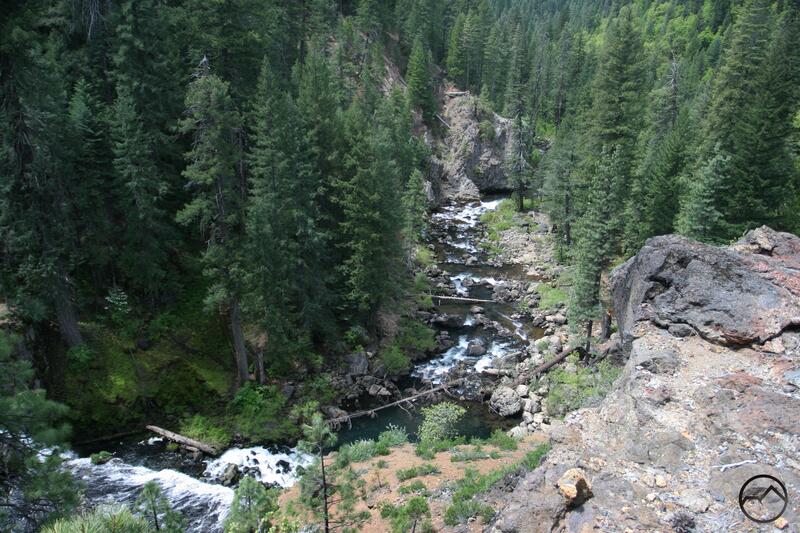 However, the McCloud River Trail offers much more than just the waterfalls. The section of trail that connects the falls, though heavily used, offers excellent river access, views of a gorgeous river canyon and interesting trail engineering through scenic volcanic cliffs and lava flows. However, the falls area that receives the vast majority of the visitors is only the last few miles of a long trail that maintains a close, parallel course alongside the McCloud. Though the rest of the trail lacks the deep canyon and waterfalls it is still extremely scenic. Highlights include deep swimming holes and small gorges through basalt bluffs. Though smaller than the volcanic features near the falls, these other points of interest are still quite attractive. 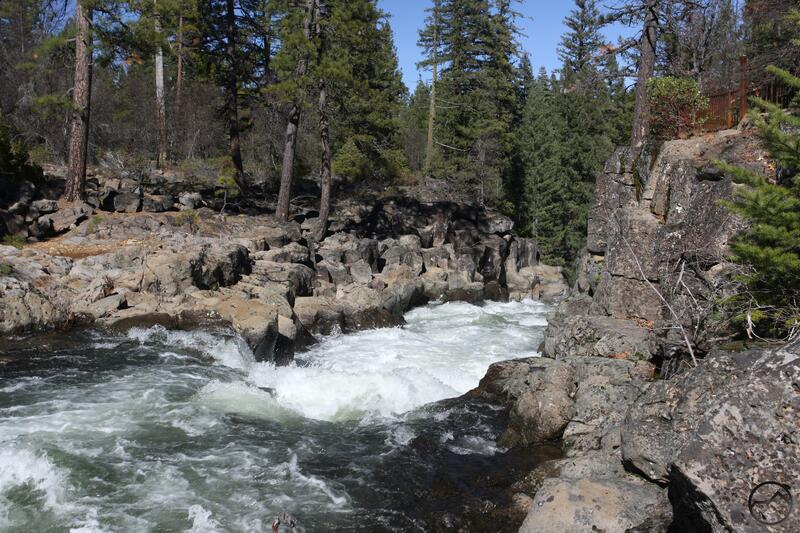 The scenic river and lonely nature of the majority of the trail combined with the gorgeous canyon and great waterfalls make the McCloud River Trail pretty tough to beat when it comes to hikes alongside creeks and rivers.